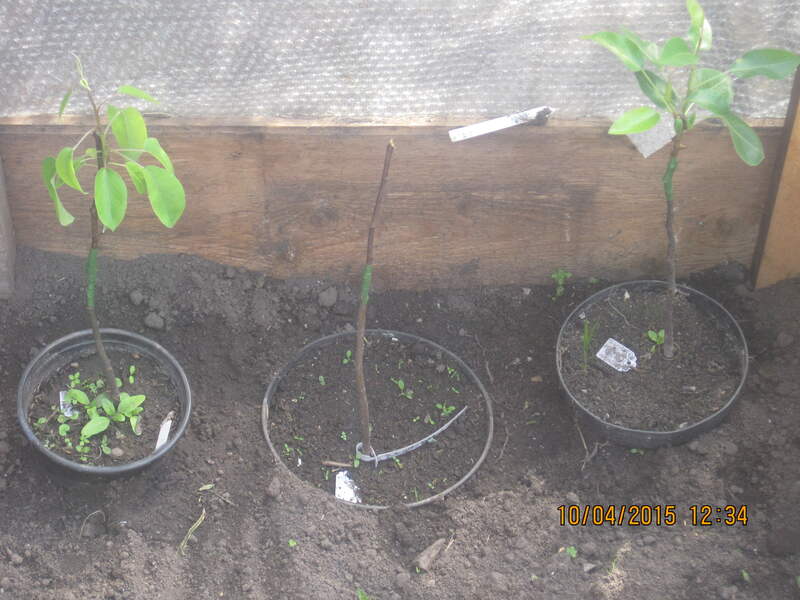 Over the winter of 2014-2015 I made my first attempt at grafting some apple and pear trees. Grafting is the act of joining two plants together. The upper part of the graft (the scion) becomes the top of the tree, the lower portion (the rootstock) becomes the root system and the bottom part of the trunk. Although grafting usually refers to joining two plants, it may be a combination of several. A third plant added between two others becomes the trunk or a portion of it is called an interstem. Some varieties of plants do not come true from seeds. Others are difficult or impossible to reproduce from cuttings or other propagation techniques. Grafting is a way to change a large tree from an old to a new variety. It is also a method of using a root system better adapted to soil or climate than that produced naturally by an un-grafted plant. Apples planted from seed won’t grow to be the same as the apple they came from. A way to ensure the variety of apple is to graft the desired apple scion to a rootstock. Grafts growing away in the spring. Burre Hardy Left, Doyenne Du Comice Right. Dabinett Centre yet to make any growth. Most grafting is done in late winter or early spring before new growth begins. The best time is after the chance of severe cold has passed but before the plant breaks bud. Scion wood should be collected during the winter. Store it in a cold, moist place at temperatures close to but above freezing. At home, a few scions could be stored in a plastic bag in the refrigerator wrapped with moist (but not damp) paper towels. Any cut ends need to be sealed so they retain moisture. With the help of some excellent videos, I grafted 22 trees, of which 14 grew successfully. Going into detail on grafting is beyond the scope of this post, but more information can be found here, and The Grafter’s Handbook is an excellent resource for grafting. Most of these varieties aren’t available in the supermarkets, so I grafted these based on recommendations in books and on the internet. Very big cooking apple, which can be eaten but may be rather sharp. Raised in Lincolnshire by Mrs Peasgood from a seed of the Catshead Codlin in 1858, said to be a heavy cropper and excellent flavour, very good for baking. Dabinett is a cider apple that dates back to the early 1900s. It was found by William Dabinett growing as a seedling in a hedge at Middle Lambrook, South Petherton, Somerset. It is a bittersweet cider apple, the variety has become widely planted throughout the southwest of England for use in cider production. Small, conical shaped, golden yellow apple. The flavour is said to taste of pineapples, rich and sweet. One of the rarest apples there is, originally raised c 1785, by 4Mr White, steward to Lord Foley at Stoke Edith, Herefordshire. It is thought to be a descendant of “the old golden russet”. It is however an unreliable cropper, always needs thinning. It is relatively prone to scab and canker, in fact the only thing this apple has going for it is that it has a fantastic flavour. George Monbiot said he would plant one of these on his allotment orchard in Oxfordshire. Bittersharp cider apple, this generally held to be the best cider apple for taste. Originally from Somerset. A very dark red fruit, sometimes almost black in colour. A weak cropper which tends to be biennial, prone to canker and scab, it produces bunches of small fruit with short stalks. First appeared in the 17th Century. The name is thought to be derived from the town Carentan in Normandy. The other possibility for the name is quarantine, meaning 40 days, perhaps referring to the fact the apple kept for about that length of time. It is said to thrive in the west country as it doesn’t mind lots of rain and wind, although is susceptible to scab. Early Dessert apple usually late august. Egremont Russet is a russet type desert apple. It has a rich, nutty flavour and crisp, firm and fairly juicy flesh. It was first recorded in 1872, and is believed to have been raised by the Earl of Egremont at Petworth in Sussex, UK. It was first popular in the Victorian era and has remained popular ever since. It is the third most common apple in commercial cultivation in England & Wales after Cox’s Orange Pippin and Bramley. A critically rare perry pear, which gets its name from the taste of the perry it produces. This variety was common in old orchards around Newent; the tree branches have heavy, conspicuous spur systems. A cross between Doyenne Du Comice and Conference. This relatively new variety takes much of the excellent taste characteristics of Doyenne Du Comice and combines them with the regular and vigorous cropping features of Conference. Introduced to England from France in 1849, Doyenne du Comice is one of the best tasting dessert pears. It should be picked in October while still firm and stored until November before eating. “Fruit, below medium size; roundish obovate narrowing abruptly towards the stalk. Skin, dull green at first, changing to yellowish green, covered with numerous russety dots and patches of brown russet, particularly on the side next the sun …… Flesh, yellowish, fine-grained, buttery and melting, with a rich, sugary and vinous flavour and a fine aroma. This one needs to be grown on Quince A as it s a weak grower , Quince C is too dwarfing. See this video for a good example of the exceptional blossom. Having recently moved to Blakeney, the place this pear is named after, it was only right to have one. Also known as Red Pear, Circus Pear, Painted Lady, Painted Pear, it is thought to have been in existence in 1600. It is the most common pear in Gloucestershire and Herefordshire with some trees over 300 years old. It derive its name and origin from the parish of Blakeney in the Forest of Dean. The Blakeney Red is a greenish yellow perry pear with a red flush on the sunny side, an old favourite which was even considered a desert pear in the 1600’s. It was also stewed and used to dye soldiers’ khaki uniforms. The primary use of this pear though is perry making and is considered one of the best single perry varieties. I grafted this onto a Pyrodwarf rootstock which should grow up to 4.5 metres.